Definition at line 198 of file cmocka.c. Definition at line 199 of file cmocka.c. Definition at line 200 of file cmocka.c. Referenced by _assert_in_set(), _assert_not_in_set(), expect_set(), and value_in_set_display_error(). 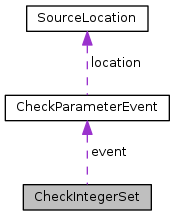 Definition at line 201 of file cmocka.c.